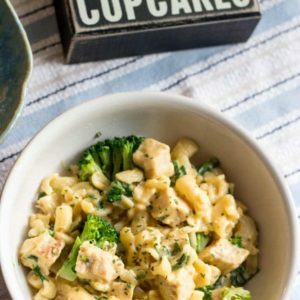 This recipe is 5 SmartPoints per serving, 1 cup. Cook the macaroni according to the package directions. Heat a large nonstick skillet with olive oil spray to medium-low heat. Add the onion and cook until the onion is translucent. Remove from heat and add the semisoft cheese. Add the chicken and stir until combined. In a small bowl, whisk together the flour and Almond Milk. Add to the chicken mixture and stir until thickened. Meanwhile, bring a small pot to a boil for steaming the broccoli. Steam the broccoli until it is crisp, yet cooked. Stir in the cheddar cheese until melted. Add the cooked macaroni, spinach and broccoli. You can substitute low fat cream cheese if you can't find the semi-soft cheese. Use 4oz of the low fat cream cheese, like you would with the semi-soft cheese.